The owner of this stunning Pool House has a discerning eye for design and an excellent taste in furniture. 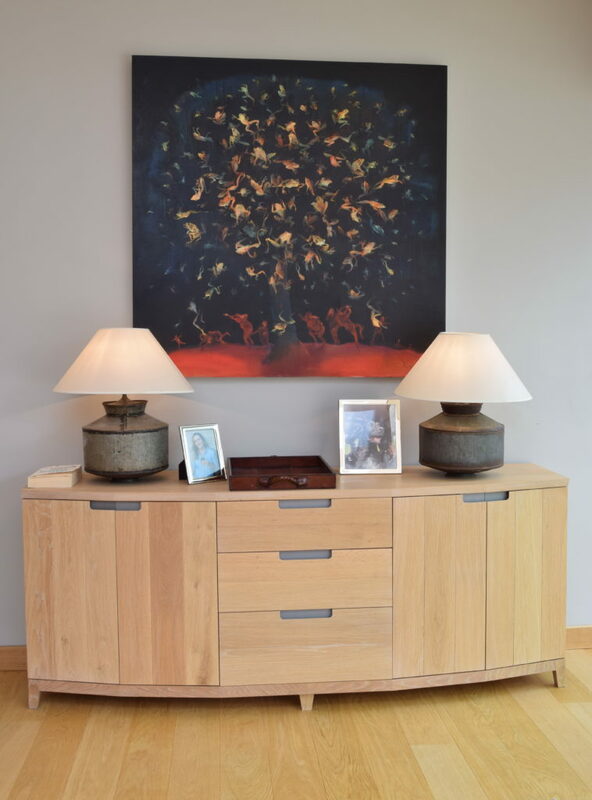 Commissioning Guild Anderson to come up with a design for some bespoke oak cabinetry to compliment the modern space was a step aside from the more formal rooms of the adjoining Elizabethan manor house. It presented Head of Design, Nick Anderson, the opportunity to create a suitably inviting, comfortable and contemporary interior. The new room neatly ties the swimming pool via the fabulous gardens to the main house and landscape beyond. French windows slide away to reveal the garden in summer or better still, let in the light on a dull day. Seated next to an open fire, this is a worthy bolthole even on a crisp winter’s day. The Pool House was featured in Country Life magazine in January 2018. Nick Anderson designed furniture for the kitchen cabinetry and two identical free-standing sideboards. 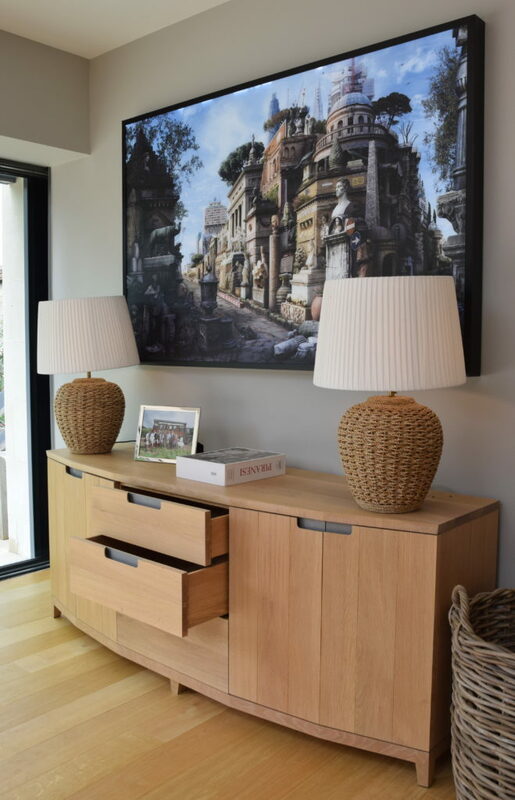 Providing a centrepiece to the room and its artwork, these demi-lune cabinets are a modern interpretation of the traditional bow front sideboard and built from European oak. The five faces of the curved design present a gentler and more contemporary façade to the room. The main feature of the cabinet door is an innovative, zinc-backed cutaway handle, an original Guild Anderson design. Made to order, as all Guild Anderson’s bespoke furniture, the fitted run of kitchen cabinetry was made to match the free-standing oak sideboards and fit perfectly the proportions of the room. With a white oil hand-finish to draw out the grain of the planked oak, the just-sanded look echoes the wood flooring while the pigment retains the timber’s natural colour and prevents it darkening. The mark of a typical Guild Anderson design, the resulting cabinetry has a tactile, pared-down finish that manages equally to be as understated as sophisticated. This is a beautiful space with its open fire and comfy sofas. On a practical level, the benefit of the Pool House’s discreet fully fitted kitchen means there is no need to run back and forth to the main house with trays of glass, cutlery or cooling plates of food. Perfect for entertaining, it has enough kitchen space to be able to make and serve a simple salad lunch for friends or a quick warming coffee after a swim in the outdoor pool. 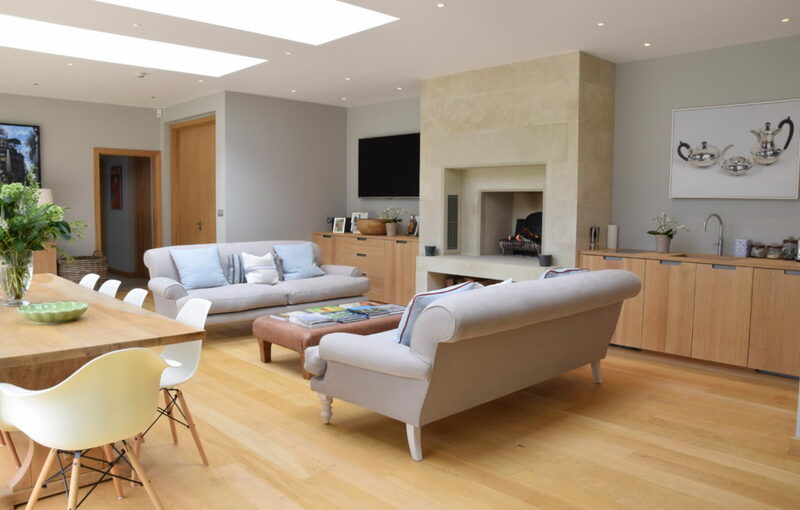 With French windows and three roof lanterns, the lightness of the furniture ensures this room stays a bright and welcoming space whichever the season.